How direct experience seems to have been replaced by the representations of life—images delivered by profit-oriented or otherwise suspiciously motivated media interveners. Self-styled social-critic de Zengotita (Anthropology/New York Univ.) offers a mostly pessimistic, mostly ironic extended commentary about the contemporary American experience. It seems that media—broadly but never specifically defined here—have taken over hundreds of millions of minds. Almost every concept, almost every tangible object, is commodified, he says. The result? It’s nearly impossible to think of even highly personal events such as birth or marriage without being influenced by images concocted by others, including movie producers, self-help authors, counselors, workshop presenters, memoirists, philosophers, and the like. Maybe a few objects are just what they are, he says, using paper clips and pencils as examples, purchased and used not because of what they say about a life, but because of their unadorned functionality. Such objects are rare in his view of the world, however, as are unmediated thoughts. He uses the death of Princess Diana as an example of mediated reality, meaning that those who paid attention “were truly grieving and they were performing. Immersed in a world continuously represented from every angle, they understood Di’s death as an opportunity to play a significant role in it, to represent themselves at levels of prominence usually reserved for the celebrated. But they already knew how to be representational.” Because it seems that anything and everything, anybody and everybody, could be considered a mediator or be mediated, de Zengotita’s hypothesis is so all-encompassing as to be elusive. In a preface, the author tells us that “the actual process of mediationis elaborate beyond imagining,” a warning that proves all too true. This extended essay perhaps would have been more effective as a magazine article than as an exhaustingly abstract, repetitive book. 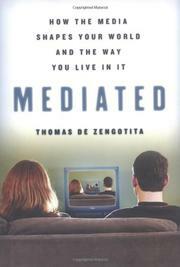 Lots of self-contained fascinating thoughts about matters such as the impact of TV on viewers, but too often de Zengotita offers seemingly random ideas in search of a lucid thesis.